One Japanese mystery novelist who comes to mind among Korean readers is Higashino Keigo. Catchy stories, mystery novels, unexpectable endings, wide genre, popular Japanese novelist, and former engineer. These are just a few words that describe Higashino Keigo. From mystery to romance, he covers a wide range of genre with his addictive and creative stories that fully engage readers. You might have read at least one of his books or have one on your bookshelf. You might have also watched a movie or drama based on one of his novels. If not, here is your chance to fall into the world of Higashino Keigo. Once you start reading his novel, you will soon know that it is hard to put it down. Welcome to the world of Higashino Keigo. Mysterious serial murders are occurring in Tokyo. Victims are a 30-year-old office worker, a 43-year-old homemaker, and a 53-year-old high school teacher. All three are found murdered and each of them has a mysterious numerical message on them. Although there appears to be no connection between the victims, the Metropolitan Police groups the murders and announces its search for a serial killer based on the similar messages found at the crime scenes. Detectives decipher the messages, and a fourth crime scene is introduced to readers. It occurs at Cortesia Tokyo Hotel, the highest skyscraper hotel in downtown Tokyo. To prevent further killings, the police dispatches a large number of investigators to the hotel and is disguised as bellboys, housekeepers, and guests. Detective Nitta, the main character of the book, is disguised as a reception worker and guided by Naomi, a hotelier who takes pride in her work. The two start noticing suspicious characters coming into the hotel. Will they prevent another murder? Through the book, the writer conveys the message that we all live hiding under a mask. 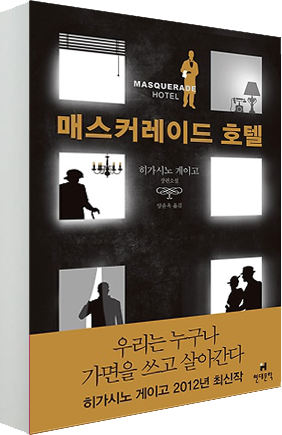 As readers will notice from the title of the book, the word ‘masquerade’ means masked ball, and there are three books in the masquerade series by Higashino Keigo: Masquerade Hotel (2012), Masquerade Eve (2015), and Masquerade Night (2018). Each book in the series is a story centered around a hotel, and masks and costumes are the core features of the books. Higashino Keigo, master of Japanese mystery, offers readers a unique peculiarity in his mystery novels. In this book, there are several representative detectives such as Detective Gaga and Nitta, and in the book, they work together to solve the case. In this respect, readers will feel as if they are being pulled into the story as the lead detectives grow in character from the start of the investigator to the end. This SMT reporter recommends the book for its rich message. It naturally describes various characters suffering from different problems in one single storyline. The reporter hopes many Sookmyungians fall into the charm of Keigo’s mystery novel. Hwaseon is a young lady who escapes from her abusive husband Taewoo to live with her nephew Yuna. One day, Taewoo shows up at Hwaseon’s house and physically attacks her. Trying to protect Yuna, Hwaseon kills Taewoo. Hwaseon’s neighbor Seokgo, who is a mathematical genius, discovers what has happened. Because he is in love with Hwaseon, he tries to protect her by making up an alibi for her. In the meantime, detectives find an unidentified dead body. After looking at the evidence, they find that the body is that of Taewoo. Detective Minbeom, a high school classmate of Seokgo, points to Hwaseon as the prime suspect. However, Hwaseon has the perfect alibi. At the presumed time of the murder, Hwaseon was at the movie theater with Yuna. She has the movie ticket receipt and is seen on a CCTV camera in the elevator of the theater. Every investigation tells the police she is not the culprit, but Minbeom continues to claim Hwaseon is the criminal. How does the genius Seokgo make the alibi? Will Minbeom reveal the truth of the case? Since the audience already knows who the culprit is, there’s no suspense guessing who the murderer is. However, it’s interesting to deduce how Seokgo creates Hwaseon’s alibi. Plus, even though the audience already knows the murderer, there is a plot twist with a hidden second storyline. The moment you feel you know how the story ends, you will be stabbed in the back after watching the ending. The film is based on the book The Devotion of Suspect X (2005). Some settings and characters are changed, but essentially the storyline follows that of the novel. The novel is one of the series of Yukawa’s story, also known as ‘Galileo’s Series’. In the novel, Yukawa, inspires detectives to solve the case, and Ishigami (Seokgo) is the college friend. There is also a third character named Kusanagi, who plays a detective. However, the book’s two characters; i.e., the college friend Yukawa and the detective Kusanagi are combined in the film version to create Minbeom. The movie dramatizes the novel, so it was pleasant to watch it as a Korean film that originates from a Japanese novel. It will be also interesting to compare the movie version with the novel version.